I write a lot on this blog about the things that I do personally to try and live in a more sustainable way. But I am always terrified to take those ‘personal ecological footprint’ tests because I know what they are going to say – if everyone lived in the same way I do, we would need way more resources than our one planet can provide. It is possible to measure the area required to provide the ecological resources and services that we all depend on – this is known as an ecological footprint. Unsurprisingly, humanity currently consumes way more than the Earth can regenerate each year. The Global Footprint Network created the term Earth Overshoot Day to mark the date when we have consumed more resources and generated more waste (including greenhouse gas emissions) than the Earth can cope with for the entire year. The global Earth Overshoot Day will be in August (or maybe even late July!) this year, however for countries with a higher average consumption that date falls much earlier. 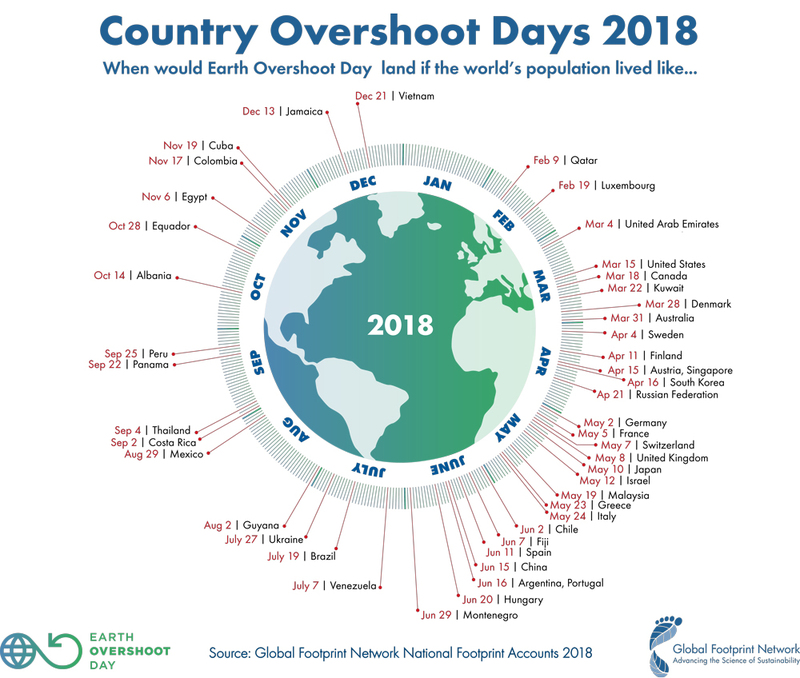 So Australia’s overshoot day is some time around now! (Which is terrifying given it is so early in the year, I can’t seem to remember it is 2019 when writing the date down yet!). 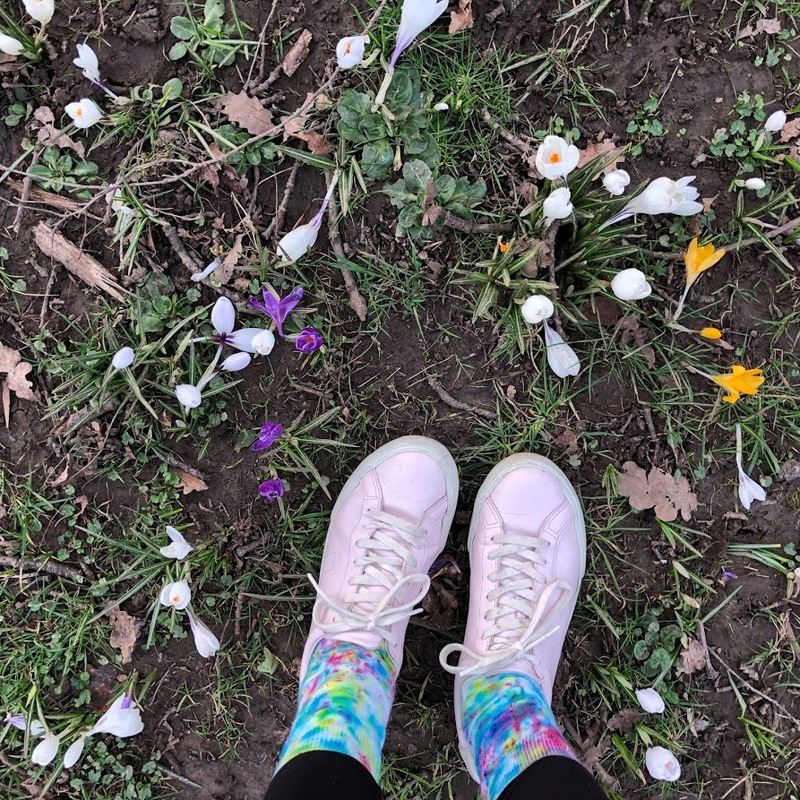 As I mentioned at the start of the post, and you will probably know if you’ve been following the blog, I try to do pretty much everything I can to reduce my environmental footprint. We buy certified renewable electricity. I eat a plant-based diet. I buy about one new (sustainably-made!) item of clothing a year. We put out about one bag of rubbish every six months. How is this not enough? See that rather high ‘mobility’ column? That’s my trip home for the year. Without flights, my ecological footprint would drop to half of what it currently is. We’d still need 1.5 planets to support that lifestyle, so it isn’t perfect, but it sure is much closer than where I’m at currently. One. Don’t migrate to the other side of the world, far away from your friends and family, and then travel back each year to visit because you miss them. But more helpfully…Two. Realise that our behaviours can have an impact, and make decisions based on that. Tools like this quiz are really helpful because as individuals we can use them to work out what changes will really matter. It is easy to get overwhelmed by listicles of ‘100 things you should do to be more sustainable’. A three minute phone call to change to a green energy tariff probably has a bigger impact, and is way less hassle, than 99 of those little things. But also…Three. Realise that as individuals we can’t do everything. There are impacts associated with the infrastructure and services we rely on, and we can’t decide how and whether to consume them. However, we do have the power to let decision-makers know (through our votes, letters and protests) that we want a transition to a society that as a whole consumes resources responsibly. 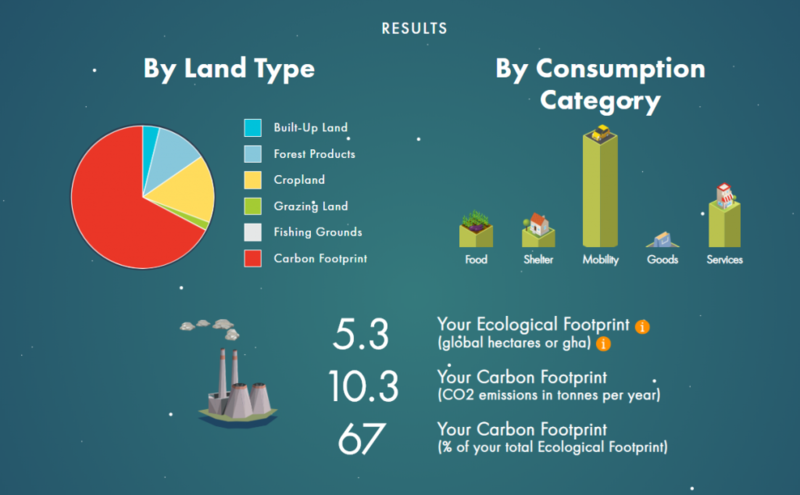 I haven’t given a very detailed explanation of the ecological footprint concept in this post. If you are interested to find out more, check out the Global Footprint Network. They are the organisation behind the Earth Overshoot Day campaign. 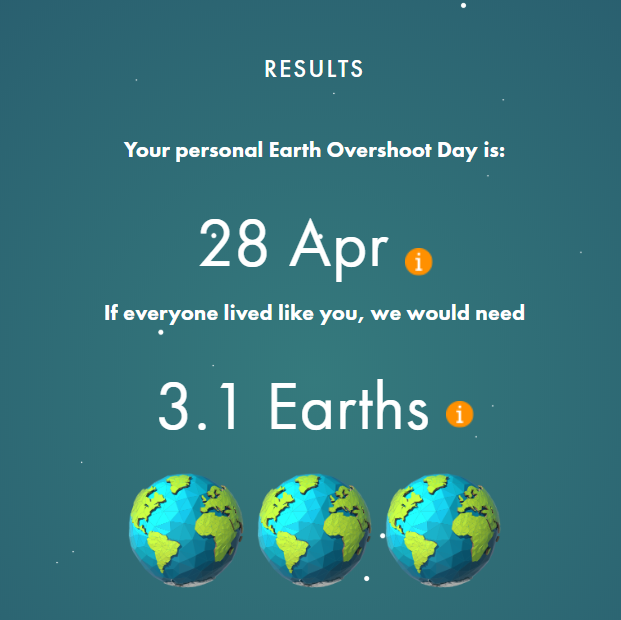 They also provide heaps of information on how to reduce your footprint and join the campaign to #MoveTheDate of Earth Overshoot Day. If, like me, you sometimes struggle with environmental guilt – this article on The Climate Lemon blog might be helpful.